Succotash - No Limas, Thank You! Succotash - no limas. That's the order. Hmmm...do people really hate lima beans that much? I guess some people do. We actually love limas, especially baby limas. But we thought we could update the succotash recipe a little. But is succotash - no limas really a salad? Does it belong here? I guess that is something you need to decide for yourself. 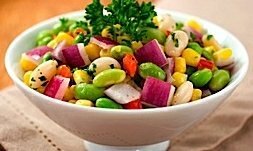 We think succotash can be classed as a delicious salad and could be served equally as well, hot or cold. In this particular version we mention serving it hot. So it is a hot salad. And why not? It is full of everything you might expect to find in a great salad - onion, bell peppers, tomatoes and so much more! And it's delicious! Succotash makes for a great side dish for almost any dinner meal or even a more formal, cooked lunch. This version updates the traditional recipe with a more contemporary flare! for about 5 more minutes or until tender.